Lieutenant Commander Blake Girling lay motionless on the main bio-bed in sick bay while Turaz sat at his office computer trying to make some logic of the meandering gibberish his medical sensors were reporting to him. "So there he is." Compz noted redundantly as Ensign Rogers scuttled around with her medical tricorder looking for anything that might add some missing piece to the puzzle. His hair was thinning out on his head and had been cropped short and his once full beard had withered to a few wisps of mousy brown hair. His body was lean and pale and the front of his skull had a small indent from his fatal injuries that had now almost completely healed. "Are you still sure it’s him?" Compz asked. "This man was like a second son to my dad after his father died." She nodded. "Although with my father that meant he almost never saw him." "It seems odd with Humans that you choose to form these family structures when you don’t seem biologically predisposed to do so." Compz smiled. "My dad didn’t seem to be." She smiled regretfully. "I know he loved me and my brother but he was always out trying to save the lives of strangers instead of us. I guess we both felt a little slighted." "From what I remember my parents ate a lot of grass." Compz shrugged. "I survived so I can only conclude they had my best intentions at heart." "My dad preferred this guy to my own brother." She explained, hardly noticing what Compz was saying. 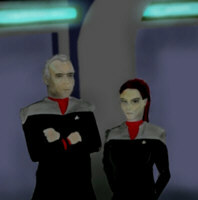 "I think it was because my brother had no interest in joining Starfleet or becoming a medic. He was more like our mother." "Being sentient is a tricky business." He agreed. "You don’t know if you’re getting it right or not until it all goes wrong." She went silent and stepped back from his motionless body, encased in the clamshells of the scanning unit. "I’m ready." She spoke softly, looking up to Compz with troubled eyes. "Proceed." Turaz called out from his office without moving. She smiled to herself and stepped forward with a loaded hypo-spray as the circular monitor assembly slid silently open. "I still get no reading from him." "Me neither." Compz agreed. "If it wasn’t for the bio-bed sensors registering his mass and my own eyes which I have learnt no to rely on then I would be unsure whether or not he was actually there." "There." She said as she injected a dose of chemicals into his neck. "That was a small dose, it will take at least several minutes to take effect." Blake Girling instantly began to mutter to himself, his eyelids fluttered a couple of times and he again fell silent and motionless. "Minutes...?" Compz asked with raised eyebrows. "I was told that female Humans are disposed to underestimate the length of things, at least that’s what Winston frequently assured me." Suddenly his eyes flicked open and he sat up quickly with a yell of pain and surprise that shocked them all. "Slight miscalculation?" Compz suggested, blustering in mild panic as he gestured to the hypo-spray that clattered to the deck plates that Katherine had dropped in her surprise. "It’s ok." She called out stepping forwards to reassure him. "It’s ok."
"Where am I?" Blake cried out, his voice husky and deep while he squinted painfully from the light. "Who are you?" "You’re safe!" She assured him. "You’re in sick bay." "Sick bay?" He groaned, slumping back heavily onto the bed. "Sick bay." "How do you feel?" She asked as he breathed heavily and settled with his arm covering his eyes. "I’ve felt better." He groaned. "Not sure about worse though." "Do you remember anything?" She asked softly, lowering herself to his ear while Compz moved in closer. "The ship?" He cried out, springing back up again and sending Compz into a fresh bout of conspicuous panic. "We’re under attack." "No, it’s all over." She said, trying to ease him back onto the bed. "You saved the ship." "Good." He sighed, flopping back easily. "My head hurts like hell." "Hardly surprising considering that a large segment of the bulkhead flew through it." Compz observed without wishing offence but unable to restrain his mouth for long periods of time. "What?" Blake said, pulling his arm from his eyes and moaning as the light cut painfully into his retinas. "You were very badly injured." She suggested diplomatically. "I guess I’m lucky to be here?" He groaned. "Can I get some water?" "Haldo?" She asked, glancing over to the replicator before quickly returning her attention back to Blake. "You’re luckier than you can imagine." "I feel like the luckiest man ever to get sucked into a Bussard collector." He told her, the effort of talking causing his throat to burn painfully. "Do you feel up to hearing what is going on and answering some questions?" She asked bluntly, passing him a glass of water and struggling to help him sit up. "I feel as weak as a Vulcan practical joke." He grumbled. "But I guess so." "Do you know who I am?" She asked hopefully, smiling broadly in anticipation. "You look like a big dark blur in the middle of a big bright blur." He replied as the cool water gently caressed his aching vocal chords. "You should see how she looks to me…" Compz grinned. "You’re an even bigger dark blur." Blake told him. "But from the smell I would guess I don’t know you, it’s the kind of thing anyone would remember." "You do know me." She told him. "You knew my father too." "Past tense?" He grumbled. "Who died?" "Ironically both of you apparently." Compz grinned. "What?" Girling snapped, looking up and trying to drag his unresponsive body to an upright position before the effort of exertion overcame him and he slumped back down. "I’m so tired, what have you done to me?" "Sleeping will do that to you." Compz observed sarcastically with growing impatience. "What’s going on?" Blake persisted wearily. "I don’t know if you’re strong enough to hear this." Katherine told him regretfully. "But time is growing short and we have to move quickly." "Go for it." He shrugged. "I could use some good news." "My father was Commander Rogers." She began with a slight twinge of sadness as she spoke his name. "He died?" Girling snapped, dragging himself up from the bed. "Yes, but not on board the Mirage." She continued, her mind racing ahead to marshal her thoughts so she could explain in some way that wouldn’t confuse or terrify him. "I thought he only had one daughter." Blake gasped, squinting as his eyes burning painfully from the lighting. "I am Katherine." She nodded. "You last saw me when I was twelve years old on board the Yorktown." "I don’t understand." He admitted. "You’ve been dead for over 10 years." Compz interjected. "You died protecting the Mirage." "What?" He sneered, in disbelief at what he was hearing. "You died protecting the ship." Katherine explained. "A section of the bulkhead hit your head as the hull ruptured and your body was sucked into space." "It looks good on you." Compz grinned. "You wear it well. Rather better than you wear the hospital smock." "My father died in a shuttle four years ago on a stupid rescue mission." She replied with a tear welling up in her eye. "He never knew when to stop…"
"This is unbelievable." Girling shook his head and winced as a torch of pain shot through his temples, scrambling his disoriented thoughts. "We were investigating a colony outpost and we found several tubes." Katherine explained. "You were in the second tube, they all contained people." "How did I get there?" He groaned through the cloudiness of his muddled mind. "We don’t know." She shrugged. "We have to leave orbit very soon, I need to know anything you can tell me before we do." "I don’t remember anything." He sighed, rubbing his temples and closing his eyes as he ransacked his splintered memory. 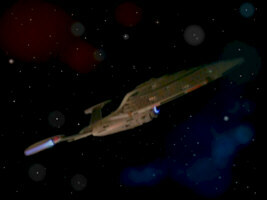 "I remember locking the ships upper phasers onto an attacking ship but never getting a good view of it. We had to fire at it through a hole in another ships hull." As he spoke the cloudy tendrils of shadowy images began to creep back into his memory. 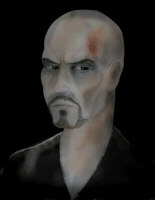 He wrinkled his brow looking for more details, anything that could remind his of what had happened. "The fleet arrived and I kept firing on this ship." He said. "That really is all I can remember." "We can’t scan you." Compz added. "Our equipment doesn’t detect you at all." "That’s impossible." Girling shook his head, wincing again at the dull pain. "It’s as if our scans are passing straight through you." Katherine agreed. "The only way that would be possible is you were emitting some kind of damping field but we can’t even detect the presence of that either." "This all sounds a little unlikely." Girling sighed, looking up from under his pitched eyebrows. "You’re telling us?" Compz smiled down with his huge rubbery lips. "What was this colony I was supposedly on?" He asked suspiciously. "What do you mean you can’t tell me?" Girling snapped in irritation. "I’m a Starfleet officer." "In my opinion…" Captain Faruqui called out from the doorway. "…That remains to be seen!" Commander Winston Morrow asked for a plate of replicated pasta, sticking very closely to what he already knew was palatable. The steaming dish materialised in front of him in a shimmering haze of silvery light. "You should try some of the other stuff they have here." Captain Graves suggested as he crammed food greedily into his mouth. "I have enough experience with replicators to know that I’ve had enough experience of replicators." Winston smiled wryly as he sat down beside his Captain. "I hear they’re planning to leave orbit." Graves said with a shrug. "They’re worried about being attacked by section 31 vessels." He nodded. "After being attacked by one I would guess they have little idea how powerful they are. They seem as much in the dark as we are." "I don’t trust them at all." Captain Graves said with a sneer. "Nor do I." He agreed. "But they’re the only chance I’ve got now that our ship is in pieces and we’ve exhausted our best lead in years." "Our ship is in pieces again!" The Captain corrected with a grin. "I need to find my sister." Morrow said dolefully. "I know." He replied softly. "But you’re not going to find her on the first Section 31 base we come across." "They’re checking the computer files for her name." Morrow said with a dampened enthusiasm. "It’s in their interest because she might be a good lead for them." "I’d like more information." The captain said thoughtfully. "Hopefully we can get a message from Haldo soon." "Yeah, they seem to trust him." Morrow said hopefully. "That’s only because they don’t have much choice." Captain Joseph Faruqui stepped quietly into the chief medical officers room where they could enjoy some privacy from the others. "Have you been monitoring?" He asked as he pulled out a chair. "I have." Turaz agreed, turning the desktop interface screen so that both men could see it. "They have made no mention of anything that would suggest that the officer knows anything more about his situation than he has admitted to." "And you’re still unable to scan him?" He pressed impatiently. "I have carried out some very thorough scans of the tube he was locked into." He offered by way of an alternative. "It is a very sophisticated device. It monitors every aspect of the human condition and has advanced computer systems capable of communicating with other instruments, perhaps subtle enough to communicate directly with the Human nervous system." "Are you suggesting he was being programmed?" Faruqui sat back and rubbed his chin thoughtfully. "Not necessarily." Turaz closed his eyes for a second as if lost in meditation. "The device is extremely sophisticated and it will take several more days before I have enough facts on which to draw conclusions." "But that would seem likely?" "It would seem likely." He admitted. "However, there were also feed-tubes that were designed to inject physical matter into the bodies." "Life support?" Faruqui asked, shrugging with slight disinterest and hoping to revert the conversation back to the programming aspect. "It clearly was designed to fulfil that function however the canisters of fluids that were being injected have other interesting properties." "One contained a colourless liquid that, much like the people inside, we are unable to detect." "I’m ok." Blake insisted as he dragged himself to the edge of the bed to sit up. His blue medical smock was pulled tightly around him as he shivered noticeably even though the medical bay was warm to the others. "You look it." Compz agreed sarcastically. Blake shot him an acidic glance. "Are you feeling stronger?" Katherine asked, her tricorder still stubbornly refusing to admit he was there. "I need the toilet." He admitted with a weak smile. "I guess that fact is empowering me." "I’ll help you." She smiled back, reaching out for his arm and helping him to his feet. "Did your father ever talk about me?" He asked as they shuffled uneasily towards the toilets. "Yes." She began. "Once when I was fifteen I joined him for a conference out beyond Rigel. I remember he was really engrossed in the lectures and for a whole day he never mentioned you at all." "He really liked you, he blamed himself for your death." She continued. "He took a lot more risks after you died, I guess that was how he came to be piloting that damned shuttle." "I’m sorry." Blake said earnestly, appreciating the bitter irony. "It’s ok." She replied dismissively. "I’ve had a long time to get over it." "What about you?" He continued. "How’s your career?" "I got amazing scores at every test I ever took and ended up on an intelligence service vessel." She replied without much pride. "This is an intelligence vessel?" He frowned. "That’s right, that’s why we’re investigating that colony." She nodded. "Starfleet intelligence?" He shook his head in disbelief. "That’s right." She agreed as she reached up to the black panel at the toilet door and pressed the controls. "I guess you’re on your own from here." "I’ll make it." He assured her. "I’ve set the gravity in there down by half so you should be able to move about ok." She told him as he stepped awkwardly inside. "Give me a shout if you need anything." "Katherine Rogers?" The Captains voice boomed out from behind her. "Yes sir!" She replied, snapping round to face the imposing figure of her commanding officer. "I would like a word with you." He told her bluntly, stepping over to the bio-bed where Compz was still standing. "What has he told you so far?" He asked as she stepped up beside him. "Nothing, sir." She admitted with a shrug. "He doesn’t know anything." "What do you think, Compz?" He asked, turning to the large alien. "Do you really care what I think?" Compz said with a knowing smile. "I see you as a consultant." The Captain replied diplomatically, avoiding his gaze and choosing not to admit that he didn’t. "I think this man is a victim of circumstance." Compz folded his arms over his bony chest where his oversized sternum showed through his thin white shirt. "I think he will be able to offer you no more information than your chief medical officer." "What do you mean?" He grumbled in annoyance. "Turaz is locked into a pattern of thinking where he looks for proof of his theories, as are you to some degree and you will never uncover Section 31 with that attitude." Haldo Compz explained. "You need to gather truths with an open mind that is ready to learn instead of wondering how pieces fit into what you already know." "I already do that." Faruqui sneered. "You can be certain that your enemy does." Compz replied firmly. "And you have failed to catch them at every turn." "I have them now." Faruqui argued through angrily clenched teeth. "Only because you stumbled onto my investigation." Compz replied, his humour vanishing altogether. "That’s why you tolerate me." "Perhaps you’re right." He angrily conceded. "That man could be a spy, programmed to kill this crew, a living bomb or a tracking device. Perhaps he is a victim but I still need to know he’s safe to have on board." "Perhaps he is not actually who he appears to be." Haldo Compz suggested. "He could be a clone or even a hologram but conjecture, while an amusing way to pass the time is otherwise pointless." "He is a piece of this puzzle." Compz nodded, unfolding his arms. "But he will not fit into what you already know." "Rogers?" He turned to face her. "I want him to submit to every conceivable tissue test you can imagine." "I’m sure he won’t mind." She hoped. "I don’t care if you have to resort to taking his pulse with your fingertips and staring at his blood under a microscope." The Captain told her with a definite note of rebuke. "If he’s to stay on this ship I want a full explanation of who and what he is now, not what he was ten years ago." "Are you suggesting we might leave him behind?" She asked with a grim severity in her accusing gaze. "Not yet." He shrugged. "If he is to stay aboard my ship then he will wear a comm badge with a constant transporter lock on him." "A wise precaution." Compz agreed. "I would run with shields up at a rotating field frequency to disrupt any signals incoming or outgoing." The Captain looked at him sternly but began to nod involuntarily. "Anything else you’d suggest?" He asked sarcastically. "I would post a guard with him and construct a force field around his quarters and suggest that he resides close to the outer hull away from any sensitive equipment or systems." Compz replied as if bored with having to do so. "The targeting system on your phasers won’t lock onto him so I would recommend the highest non-fatal setting at wide beam." "Sounds reasonable." He agreed with a wry grin. "He’s not dangerous." Ensign Rogers insisted. "He seems more inclined to trust you so you’ve just volunteered to work with him." Captain Faruqui told her. "In the mean time, I hope that Mr. Compz continues to make his talents available to us. Commander Sarah Brown stood at the circular bridge at the top of the ship, reviewing data on her portable terminal as the junior officer stood in front of her briefing her without the apparent need to stop for breath. She nodded in time with his voice, barely noticing what he was saying. She glanced up and noticed his blue lips as they moved together, mouthing the words that she was dutifully ignoring. Between them was a noticeable amount of thick clear liquid that pooled between his teeth as he spoke. She looked back down to her terminal that had all the information that he was trying to give her already laid out on it between convenient menus and prompts. "So!" She began, cutting off his rhetoric. "You have gathered this information from the available comm traffic from this base?" "That is correct, sir!" He agreed with a proud nod. "It was quite difficult." "They have been speaking with another base about the tubes and about the Scarabs?" She continued, already having the answers but needing to be very sure of her ground before she informed their somewhat irritable Captain. "The Scarab is mentioned several times, as are the tubes." He replied, clenching his hands behind his back and rocking on his heels. "Whatever their function they are connected in some way." "That will be all." She said finally, deliberately declining to thank him. "Yes sir." He nodded with noticeable disappointment that she had failed to comment on his talents. "Commander Brown to Captain Faruqui." She spoke into her comm-badge. "Faruqui here." Came the instant reply. "I need to speak with you right away sir." She smiled thinly. Blake Girling pulled down the grey T-shirt over his tired and aching body and breathed heavily from the effort. "So I don’t get to wear a Starfleet uniform?" He called out from the bathroom of his guest quarters. "Sorry!" Katherine turned to Compz who was sat next to her and sighed that she couldn’t offer him better news. "You’re not fit for duty, I’m sure the Captain will allow you one when you’re feeling better." "It’s ok!" He sighed, splashing water onto his face and staring at himself in the mirror. His eyes peered into their reflection as if hunting for the shadow of himself deep in the image he cast. "The uniform is over-rated." Compz added. "I preferred those old ones where all the women wore short skirts." "They don’t do that any more." Katherine told him with pointed annoyance. "Worst mistake Starfleet ever made!" Blake agreed, stepping out from the bathroom and flopping heavily into the large grey seat at the corner of the room. It was plainly decorated and dimly lit but comfortable and functional and it even had a window which was a rare thing on what was essentially a large battleship. "Or at least I thought so until today." "Rough day?" Compz asked with a knowing wink. "I’ve had better." He replied. "I have some questions if anyone feels ready with some answers." "Feeling better, are you?" Katherine smiled. "A bit." He admitted, returning her smile. "Who is Section 31?" "I’m not allowed to say." She said with regret while turning to the tall Moronian. "Luckily Compz is…"
"Do you remember the reports of the first ever visual contact that Humans ever made with the Romulans?" He asked, leaning forwards. "I think so." Blake nodded. "It was Kirk who made contact, wasn’t it? Aboard the Enterprise?" "That is correct." Compz agreed with a cheery nod. "You’d met them before but never seen them when Kirk and his crew finally got a glimpse." "It scared the hell out of them." Compz smiled. "They looked like Vulcans, pointed ears, silly hair cuts and pitched eyebrows." "Yeah, they were the same race but split centuries ago." Blake agreed. "They didn’t know that and the Vulcans hadn’t bothered to tell anyone either." Compz began. "The Enterprise crew wondered what the hell was going on and quite rightly too. These Romulans were threatening them and they had a Vulcan officer on board in a key position who suddenly looked like a spy or something." "You have to understand the feelings of Humans at the time." Katherine added. "The Federation was pretty new, as was Starfleet and it was working out really well. The peaceful exploration of space was coming along nicely built mostly on the shoulders of us and the Vulcans." "Starfleet was terrified that this was all going to end in tears." Compz continued. "They were afraid that the Vulcans weren’t actually what they appeared to be." "They couldn’t do anything because they had to publicly trust the Vulcans or the Federation would be over." Katherine interjected, caught up in the mood. "That was when they started Section 31." Compz said sadly. "They were separate from the Federation or even Starfleet although they were bound by the same rules, at least at first." "They were just meant to explore the Romulan/Vulcan situation and find out if there was a threat to the Federation." Katherine shrugged. "That was all." "They were totally autonomous." Compz said. "They were kept out of the chain of command so their existence could be denied if things went wrong, they were a secret but were well supplied and determined to keep the Federation safe." "And they’ve been operating ever since?" Blake said, leaning back heavily. "They’ve been growing more powerful and secret all the time." Katherine admitted. "They have access to Starfleet at the highest level and have been skimming off technology and power." "This ship doesn’t pose much of a threat to them." Compz said sadly. "Nothing does." "And Starfleet intelligence is trying to stop them?" Blake said with an amused grin beginning to spread across his face. "They have access to the people who give you orders and they’ve ordered you to stop them?" Blake asked. "And Captain Faruqui is put in charge of hunting them down?" "I have nothing to do with this!" Compz made a point of noting his own position. "I come from a colony set up by Section 31 where we were genetically modified to be better suited to space travel." "So what are you after?" Blake asked coldly. "From what I know, the experiment largely failed so my colony was destroyed." Compz replied evenly. "I guess I’m after revenge."